This Fork Will Block Out The Sound of Loud Ramen Slurpers…Kinda | OhGizmo! By Randy Donack on 10/24/17 • Leave a comment! Ramen company Nissin is releasing a limited edition fork that deals with loud ramen slurpers. 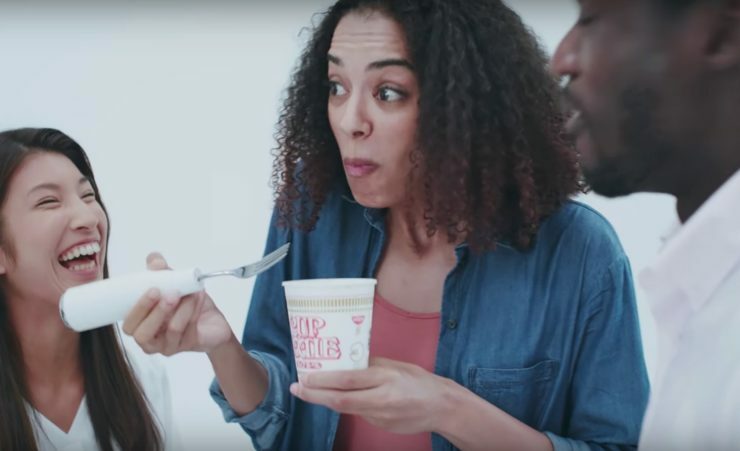 By the company’s own video, the fork is called ‘noise cancelling’ and goes into detail about how they took numerous samples of people slurping noodles to gauge the sound. So, with all that information, I assumed it would work like noise-cancelling headphones. Boy, was I wrong. What actually happens is, when you slurp with the fork, the microphone picks it up and tells your phone to play an even louder noise, which sounds almost like an engine. That’s hilarious, it just drowns out the slurping noise with a louder turbine noise. It’s like shooting yourself in the leg to drown out the pain of stubbing your toe. Maybe we should try that with other things. Next time you’re in a movie and the people in front of you won’t be quiet, just start yodeling at the top of your lungs. Hey, you won’t hear them talking anymore. It’s a silly product, but I’m not hating on it. Although it is limited to 5,000 and will cost $130, and that’s the real crime.